Today was a day to play “Greyhound Romp,” a fun, less-structured event than usual where the dogs could just play. It was a beautiful, warm December morning. We entered the fenced field where a few dogs were already running and playing. I unleashed my boys so they could join the fun. As they took off, I realized the others had turned and were heading for us. 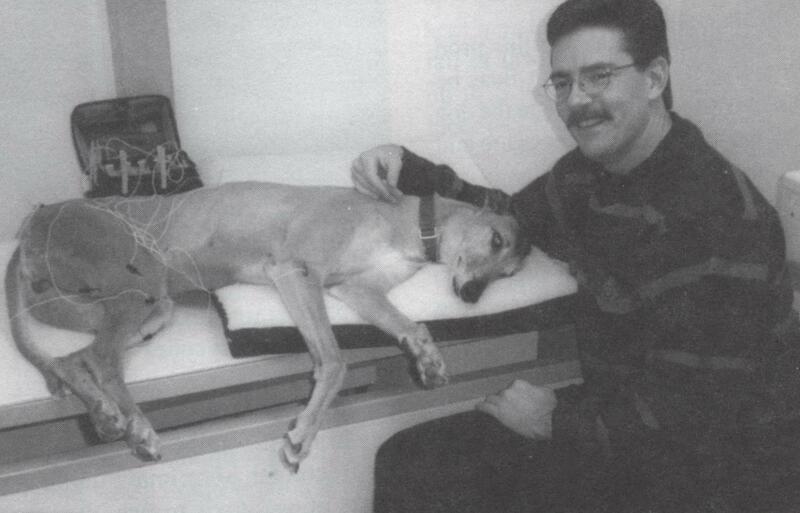 In classic greyhound style Adam and Sabre were competing with each other and not looking ahead. I was running before the crash happened. Adam had nowhere to go. As he looked up, an approaching dog impacted into the side of his neck and upper shoulder. His back folded like a book as he crashed to the ground. The cries and screams were incredible. Still some 20 feet away, I knew it was his spine. I had seen him try to bounce back to his feet after the initial fall, but only his head and neck moved. As I approached, I knew I had two immediate responsibilities to Adam; to protect him from the other dogs and to keep him calm to protect him from himself. I slid across the ground and threw my body over his. Everyone made the right decisions. Every dog was under control within seconds. A yell came out to get a vet. We were surrounded by caring people who offered calming words and assistance to Adam and me. I lay with Adam trying to convince him he was safe. The next 30 to 40 minutes were an eternity. Adam was nervous yet relatively still. Erin offered the advice of a physical therapist; don’t move him or test his back. Adam was very calm. He appeared to have feelings in all paws. He could move his back legs, but his front legs appeared to be stiff and straight. His calmness made us all question the seriousness of his injury. Perhaps he was just bruised and shaken. Perhaps we were over-protective parents. Then the hard part started. At any accident scene there is always a misguided fellow who belittles the concerns of over protectors. “Stand him up; he’s a dog. Stand him up. See where he hurts; it’s probably just a broken bone. Stand him up, stand him up, STAND HIM UP!!!! 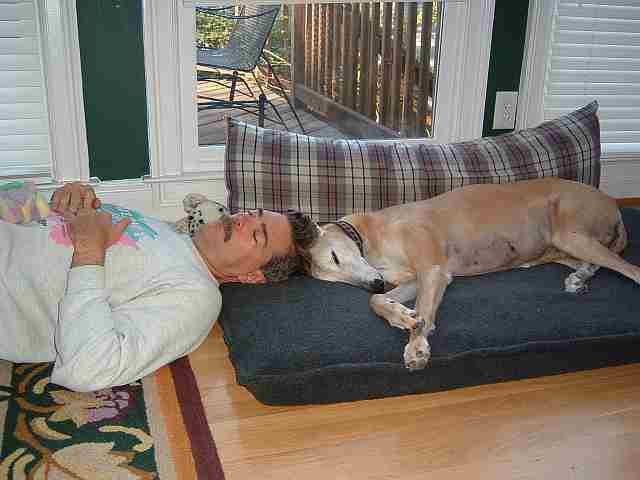 !” The screaming man was not a greyhound owner or a vet, but a Frisbee dog trainer. His unrelenting persistence past the point of harassment began to break down the common sense thoughts of the surrounding crowd. A couple of people began to suggest that we test the waters. I, too, began to question my logic of protection and lying still. The power of suggestion during moments of weakness and confusion can make it hard to reason. We lay still and waited for the vet. The field examination confirmed our fears; it was a spinal injury. The field vet administered a shot of anti-inflammatory cortisone. We loaded Adam on a piece of plywood and drove off to Atlanta. Our veterinarian took one x-ray and confirmed the field veterinarian’s finding. They were too afraid to roll him over to take additional x-rays. He had to go to the best hospital around ­ the University of Georgia Small Animal Teaching Hospital. We went off to Athens on a 90 minute drive that seemed to last forever. The staff in Athens was waiting outside as we drove up, giving us a feeling of confidence knowing they cared. Within an hour Adam had been examined by the resident orthopedic surgeon and a neurologist. By 8:30 p.m. their diagnosis was in: Adam had suffered a trauma to the spinal cord itself. Blood was in the spinal fluid. The partial paralysis was caused by a cutoff of blood supply to the spine. The good news was that there was no permanent damage to the vertebrae, disks or cord. Though it would be a long, slow process, they believed Adam would recover. There would be no surgery; just time and therapy. Adam spent the next few days in intensive care with 24 hour surveillance. It was nearly 48 hours after the accident before University of Georgia veterinarians were ready to stand him up. As soon as he could stand they sent him home to a happy family and an eager brother. Our job was to build his confidence and teach him to walk again. The first week was terrifying. Adam was a shell of the dog we knew. He looked like a frail 90-year-old man. He couldn’t stand on his own. His spine had a more than three-inch curve that was present no matter what position he was in. He was in serious pain. Adam receiving acupuncture with Craig at his side. Because of the diagnosis, two days later we took him to a holistic vet, Dr. Dwight Hooton (“Hoot”) of Loving Touch Animal Center, for acupuncture and chiropractic. The results were spectacular. After the first treatment Adam began to show dramatic improvements. He stood a little better. He wagged his tail for the first time and showed signs of the happy dog inside that we once knew. For the first time we felt he would recover. Two months have passed. Adam is progressing wonderfully. He continues to show improvement after each weekly acupuncture and chiropractic treatments. He has his personality back and is a happy dog again. The strength continues to improve in his legs daily and his spine has pretty much straightened out. He walks nearly two miles every morning, and runs a little in the house. We hope to get medical clearance soon to let him off leash in the yard. The acute healing is behind him. Now all that remains is the slower process of chronic healing to relieve the minor back pains and small physical challenges. He may only make it back to 90 to 95%, but for all intents and purposes he will be normal again. 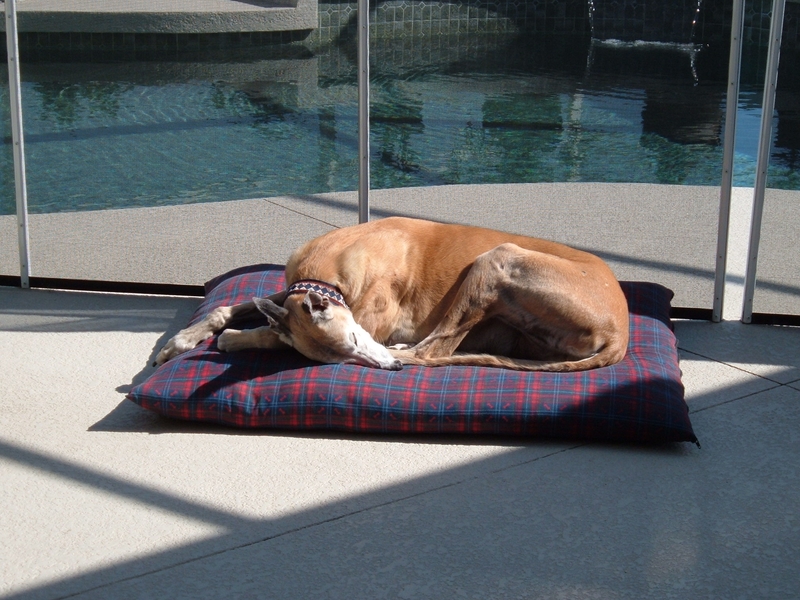 The veterinarians at the University of Georgia felt very strongly that the near immediate injection of anti-inflammatory medicine and the careful stabilization without moving him were both critical in reducing his chances of permanent damage. Most dogs they see in this situation have had the accident six to eight hours earlier just like Adam, but they typically do not get the same careful treatment. The first few hours after the accident can cause nearly as much serious damage as the accident itself. Once everything gets inflamed and the spine isn’t getting a proper blood supply, the animal should not be moving around. Happy as a clam now. 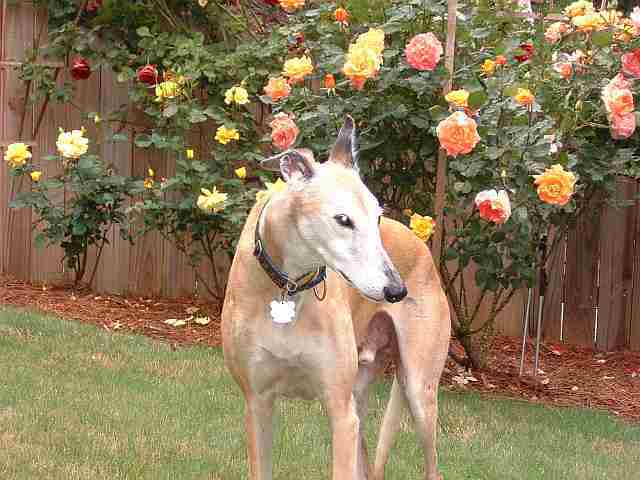 This was a freak accident, and yes, we do plan to let Adam and Sabre play with the other greyhounds again. We will exercise a little more caution, but we have to let them be dogs. Beyond wanting to please you, running and playing is what they love and live for. The moral of the story is: take all potential spinal injuries extremely seriously. Protect your dog. Think calmly and logically. Don’t let the confusion of the moment cloud your judgment. Listen to the voices of level-headed influencers and block out the voice of the always present misguided fellow. You make the decisions, not the people around you. Treat your dog’s spinal injury with the same concern and care you would a child. You owe it to him. Craig and his wife Ady moved from Atlanta to Florida in 2004. Adam’s injury occurred Dec. 14, 1996 and Adam passed away Feb. 28, 2006 at just 6 weeks shy of 13 years old. We credit acupuncture and chiropractic done as soon as he was released from the vet school for his recovery. Adam was never 100%, always a little wobbly and needed treatment regularly but he was a happy sweet boy who adored his daddy who protected him the day that changed our lives forever. Our house always had runners so Adam could walk around securely and we even took them on vacation with us since he always went with us. Adam and Craig, always together. Thank you Catherine. We wrote that in early 1997 but feel it’s an important issue everyone should be aware of. Many thanks to Marcia for this site and all the wonderful info in it.